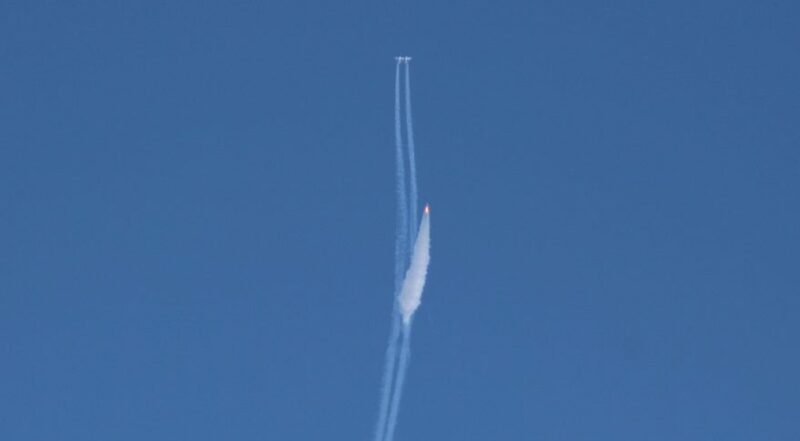 Virgin Galactic achieved a long-awaited milestone Dec. 13 when its SpaceShipTwo suborbital vehicle performed its longest test flight to date, exceeding one altitude often used as the boundary of space. The WhiteKnightTwo aircraft carrying SpaceShipTwo took off from Mojave Air and Space Port here at 10:11 a.m. Eastern. The aircraft released the SpaceShipTwo vehicle, named VSS Unity, at 11:00 a.m. Eastern at an altitude of about 13,100 meters. With pilots Mark Stucky and C.J. Sturckow at the controls, SpaceShipTwo fired its hybrid rocket motor for 60 seconds. The vehicle reached a peak altitude of 82.4 kilometers and top speed of Mach 2.9 before gliding back to a safe landing here at 11:11 a.m. Eastern. That altitude exceeds the boundary of 50 miles, or about 80 kilometers, used by U.S. government agencies for awarding astronaut wings. Bailey Edwards, FAA associate administrator for policy, international affairs and environment said in post-flight remarks that Stucky and Sturckow would receive FAA commercial astronaut wings from the agency in a future ceremony.